Read the Key Verse with your class. Children may have a hard time understanding today’s memory verse. Ask them what David did for his father when he lived at home (he was a shepherd, tending his father’s sheep). When God sent an evil spirit to trouble King Saul, who did he want to kill? (David) Do you remember why? (Saul knew that David would be the next king.) Do you think David was ever afraid? (yes.) Do you think he ever wondered if he would ever become the king as God had told him? (probably.) Last week, we saw that David was crowned as the king of Israel. David probably never knew that he would be such a great king that the kings that followed him would be compared to him (II Kings 14:3; 18:3; II Chronicles 29:2, etc.) Today, we see how great of a king David was. Most importantly, we see that God was most important to David, and David became known as a man after God’s own heart. Summary: Today we continue in the life of David. We see that God is important to David. We then see that David is important to God. When David kept God first in his life, we see that God established him as a conquering king. He not only brought the enemies into subjection, but David was also revealed as a compassionate king. He found a living relative of the former king, Saul, and brought him to his home and restored his land. Because of David’s faithfulness, God made him a promise: II Samuel 7:12 & 16: “12. And when thy days be fulfilled, and thou shalt sleep with thy fathers, I will set up thy seed after thee, which shall proceed out of thy bowels, and I will establish his kingdom. 16. And thine house and thy kingdom shall be established for ever before thee: thy throne shall be established for ever.” We will learn today that this is a promise not only of his son, Solomon, who became the next king, but a promise that God’s son, Jesus, would one day be King of Kings. Emphasis: We see Matthew 6:33 lived out in David’s life, long before it was even written: “But seek ye first the kingdom of God, and his righteousness; and all these things shall be added unto you.” We must live a life seeking God first, just as David did, and then we can see God bless our lives. One idea for today’s lesson: (See picture below). 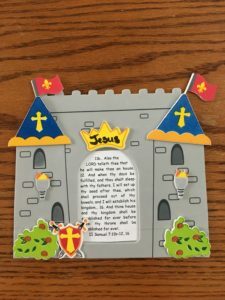 For today’s lesson I found a foam castle kit and modified it to fit today’s lesson. In the doorway we glued the verses II Samuel 7:11b-12, 16. 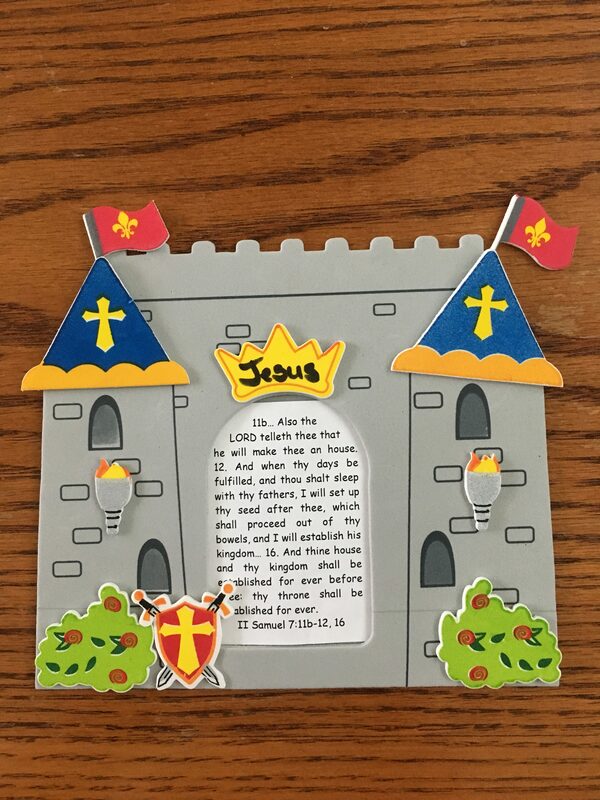 In the crown sticker, we wrote the name Jesus to remind us that the promise extended past the immediate future into the very distant future when Jesus would finally be born.